Jules' Got Style - Boutique Girls Clothing Blog: What?! Jak and Peppar Is Sold Out Already?! Are Boutiques Restocking Their Inventory? What?! Jak and Peppar Is Sold Out Already?! Are Boutiques Restocking Their Inventory? Jak and Peppar fall 2014 collection debuted yesterday and swept the fashion community off its feet. Customers were sent into panic mode over styles that were selling out so quickly. By today, boutiques that carry Jak and Peppar are already sold out of the most popular styles like Jak & Peppar Follow Your Heart tunic dress in both color ways and Jak & Peppar Farrah Peasant blouse in red. So, what's next? Yesterday Jak and Peppar contacted all of the retailers letting them know that they are working with the manufacturer to see how - and when - they can produce more products to replenish inventory that vanished from boutiques in the matter of hours. Boutiques were allowed to send reorders in. My Little Jules among them. Not only we sent a reorder for the styles that we originally had on our website, we also added many more styles that we think all of our Jak & Peppar customers will love. We are now waiting on the reorder confirmation to come through. As soon as we get that reorder confirmation, we will be adding products to our website. Customers will be notified via Facebook and through our email newsletter. So, keep an eye on our Facebook page and on your inbox in case you are a subscriber (subscribe to My Little Jules newsletter here). We recommend not to wait to place your orders once Jak and Peppar styles are back in stock; they probably won't stick around for too long. Those of you who have requested particular styles will be contacted via email or Facebook. We should have an answer within the next few business days. We expect Jack and Peppar styles for all reorder to be shipped a couple of weeks after the original batch of products will be dispatched to the boutiques. So, if you place your preorder after August 4th, you will most likely have your order around the end of September. Jak and Peppar is a brillian mix of indie, gypsy and boho chic styles which make it so unique and appealing to moms and girls alike. To put it simply, Jak & Peppar is Free People for kids. My Little Jules is among very few retailer who carry the whole size run (from 2T to 16 years), so whether your girl is a toddler a teen, we got her wardrobe covered! Click here to shop. 4. Pay 15% non-refundable deposit and take up to 8 weeks to pay. Use code MLJPaymentPlan at checkout. Lean more here. Shipping is always free in US and Canada on orders $79 and up. 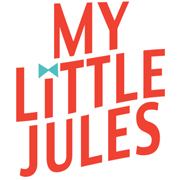 My Little Jules also offers 5% back on most purchases with our Jules Rewards Program. Jack and Peppar size chart can be found below. Thanks for shopping at My Little Jules! I just placed an order yesterday from this brand... how soon will I get it. If it's on the website, is it available and ready to ship?